Multiple sources on Capitol Hill and in key special-interest groups involved in national security issues say they have been told to be prepared for a Chuck Hagel nomination for Defense Secretary, either as early as Monday or perhaps more likely Tuesday of next week. While it's still possible for the president to have a change of heart, all signs are pointing to a Hagel nomination. When President Barack Obama returns to Washington this weekend, he will still have two big cabinet posts to fill and the current favorite for Secretary of Defense – Chuck Hagel – is taking heat on a range of issues. Obama 2012 traveling press secretary Jen Pskai and former RNC Chairman Michael Steele discuss. That said, a White House spokesperson tells NBC News pretty emphatically that the president has not made a final decision and does not expect the president to make a final decision until he gets back from Hawaii. The White House spokesperson adds, the "chatter" about Hagel-as-the-pick in the national-security and Capitol Hill communities is "premature." That said this spokesperson acknowledged Hagel is a "leading contender." For what it's worth, the reason a lot of outside sources are being given a heads up on Hagel is that the White House knows if Hagel is indeed the president's choice, it's going to be a real fight. President Obama responds to criticism of Chuck Hagel as a potential replacement for Defense Secretary Leon Panetta. 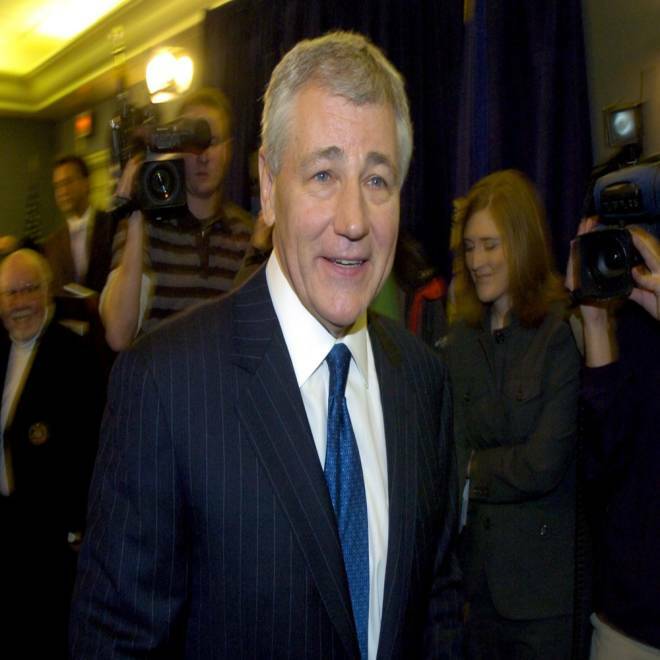 Hagel's 2008 statement that "the Jewish lobby" intimidates many lawmakers has drawn criticism from both sides of the aisle, and some have painted him as weak on defense issues. Democrat Chuck Schumer of New York, a top-ranking Jewish senator, passed on the opportunity to offer an endorsement for Hagel during an appearance on Meet the Press, while Republican Sen. John Cornyn called his positions on Iran and nuclear weapons "unacceptable." Hagel also recently apologized for his 1998 opposition to an ambassadorial nominee whom he described as "openly, aggressively gay." There are as many as 10 Democratic senators who could vote no, Capitol Hill sources say. But Hagel has some big backers besides the president who would become the key point people in getting Hagel over the finish line – Vice President Joe Biden and Rhode Island Sen. Jack Reed, both of whom are huge proponents of Hagel. Asked on MSNBC’s Morning Joe about the opposition to Hagel, Obama political adviser David Axelrod defended the former Republican Nebraska senator. Senator Chuck Hagel (R-NE) leaves a news conference in Omaha, Nebraska in this March 12, 2007, file photo. Bottom line: It appears to be Hagel, but the White House says no final decision has been made. News of the expected nomination was first reported by Foreign Policy magazine's The Cable blog.